The skill of conflict coaching is to support others in resolving their own conflict rather than try to 'fix' it for them, or ignoring it and wishing it would 'go away'. via our enquiry page to find out more. 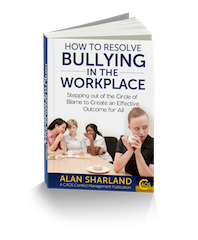 In the workplace, managers are often called upon to intervene in difficult relationships between staff, but the intervention will often be one of trying 'fix' the problem, effectively suppressing it. This will be outside of the expected requirement of any manager - they were not appointed to fix people's relationships but to manage and oversee performance and effectiveness. Unfortunately the 'fix' rarely works because there has not been resolution of the initial difficulty and as a result, resentment can occur towards the manager for requiring actions that do not appear to acknowledge the difficulties of those involved in the situation. Conflict coaching allows for an expression and acknowledgement of the difficulty without fixing it. Conflict coaching expects the person involved to take responsibility for creating their own resolution of the problem, enabling the manager to remain focused on their role of overseeing performance of their team. The confusion between what a manager is responsible for and what they are not responsible for in this regard is a common issue within workplaces. But where a manager simply says 'I don't want to hear about your problems' they can be accused of failure of duty of care towards their staff, so avoiding or ignoring the issue is also not acceptable. What does Workplace Conflict Coaching Training teach me? How will I work alongside this person who I presently have difficulty with? How will I maintain my own work performance in their presence so that I am not seen as failing in my role. ………and to come up with answers for themselves, because ultimately only they can in such situations. Where an employee has clearly breached some form of expected code of conduct it will remain the manager's role to take action. But most workplace disputes are not examples of code of conduct breaches or gross misconduct for which a manager has the power and duty to act upon. The disputes are about different values and expectations, different ways of communicating, different understandings of each other's role, different pressures arising from taking a different role within the organisation etc. None of these are issues which a code of conduct is likely to cover. If you would like Workplace Conflict Coaching Training for yourself or would like training for your managers and team leaders, or for particular individuals within your organisation please contact us. We offer training for individuals via our general training course or we can provide a bespoke course for your organisation. Whichever option you prefer please contact us on 020 3371 7507 or contact us online via our enquiry page. The CAOS Conflict Coaching Clients Handbook - click the link or the image above to purchase.